A deadline always helps. Tomorrow is "Breakfast Club." The last Thursday of the month I join a group of ladies in Anchorage to sew all day. My favorite part is show and tell...and I had to get some stuff done to bring. I got the borders done on this quilt today. 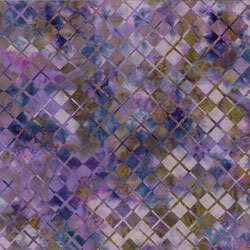 This is a kit I bought at the Houston Quilt Show last fall called, "Irish Mist." No bear sited yet today but I did see a moose on my way to Jazzercise this morning...not the best pics but she was hiding. Moose are huge but they blend in well. Now I need to get my fabrics ready for tomorrow's extreme sewing session. 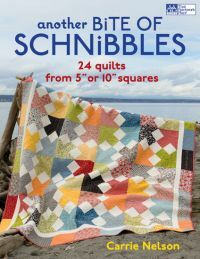 We are making "Reveille," which is the cover quilt on Carrie Nelson's, "Another Bite of Schnibbles." I think we are getting used to each other! He came for a visit this morning. He's been eating the wild grass in my yard. I guess I don't look too tasty. So far he leaves when he hears my clicking camera...not very quickly though. My sons and I have been discussing names for him...or maybe her. It is finally summer in Alaska. We are having weather our tourist bureau would be proud of. Temps in the low seventies and tons of sunshine. Perfection. We are all trying to catch up on our vitamin D deficiency. This Memorial Day, take a few minutes to watch this video. I was standing on our deck and got this pic. He was close enough to talk to. He didn't like the sound of my clicking camera, so he left. Yes, I do look both ways before opening a door to go outside. Yes, bears know how to open doors. Yes, I do keep my doors and windows on the ground level locked most of the time. 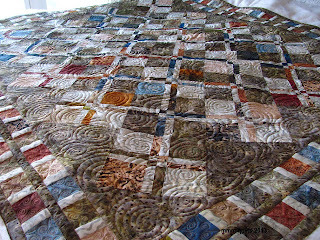 How appropriate...I quilted on my Nolting yesterday...this quilt. Apparently my Nolting enjoyed it's 21 month sabbatical. Her stitch was perfect with only one tension adjustment. I was so amazed and thankful. Unfortunately, my muscle memory has atrophied when it comes to free-handing quilt designs. All I did yesterday was meander...which in this case will be called a camouflage quilt stitch. I am so happy to say...I'll be putting binding on this quilt today! I haven't done that in 21 months either. Finally...not one bear sighting yesterday...but two! We saw this little chubby looking bear about 7 p.m.
Then at 11 p.m., as I was closing a window on my way up to bed, I saw a bigger black bear in my neighbor's yard. It was dusk so very hard to get a photo in focus. It was enjoying munching on some grass. This is what's going on today in Paris near our apartment. 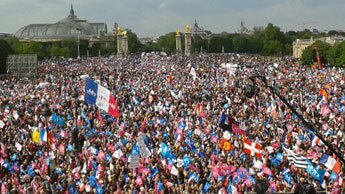 Over 200,000 protesting the passage of gay marriage and adoption. Hubby says it is very noisy at our apartment which is about a third of a mile away. I'm happy to be in Alaska. Yesterday I loaded a quilt...I am planning to turn on my Notling Fun Quilter, Marta, and see if my muscle memory will kick in. I basted my dresdan plates to their backgrounds. Now I am playing in EQ 7 for a layout. A backwards approach to quilt design! Here's my current favorite design...about my 40th version. I want to add something...isn't that always the case when working with EQ? I've seen moose almost everyday since I've been back but I've always been driving so no opportunity to get a photo. Finally, tonight I saw this young cow walking through the back yard. I just don't have time to quilt. I had lunch with one son today and dinner with the other. It was a good day. When I left the nest about thirty years ago...I never imagined I would wind up living in Alaska (or Paris!). Alaska's popularity as a place for shows on the Discovery Channel just doesn't end! And we often know people on these shows. Several years ago my oldest son was on an episode about Alaska bush pilots. We know a couple of the troopers who have been on, "Alaska State Troopers." And of course...we know some of the pilots on the aviation shows. But the latest star on a new show about Alaska is Marty Raney...a man of many vocations. He did the rock work on our fireplace...it is spectacular. Marty is a singer and song writer. I missed this episode while in Paris but one of my sons shared this with me...Marty singing on an episode of "Idiot Aboard." In case you want to sing along...here are the lyrics. Now there is a new Alaska-themed show on the Discovery Channel and Marty is on it. Sunday evenings, "Ultimate Survival: Alaska." I'm enjoying it. Marty is very entertaining. Here's a link to Marty's Profile on the show...eight more episodes to go. I have never seen Marty without his hat or white buttoned-down shirt. Way back in January, my husband and I were in Paris. We got a phone call from one of our son's while in the middle of one of our French lessons. The septic system of our brand new Alaska house had backed-up into our basement. The basement is all about my sewing room. Open sewage in my studio...I was extremely upset. Professional cleaners were hired. Sometimes I don't like our new house. Actually...lots of times I don't like our new house. It is lots of work for me and continues to be lots of work. The good news is the problem with the septic system seems to be resolved. Of course there is a lot more to the story but who really cares? It's just too nasty to talk about. Before I left for Paris last October, I put everything in my studio on wheels or in plastic totes. I've lived in Alaska enough years to have heard a few horror stories about water in basements. Nothing was harmed in our basement. The sewage was actually mostly confined to the small bathroom in the basement. But the cleaners moved everything in my studio...to include my longarm. So my first order of business on arriving in Alaska two weeks ago was to set up my studio, which is also my office. It's in good enough shape to start using...but there are always unexpected delays. I keep trying to work on quilting projects...but I can't find anything . I don't seem to have a rotary cutter. How can that be? Why did I just figure this out today? I was just at JoAnn's yesterday!!! It is impossible to work on a quilting project without a rotary cutter. Tomorrow I meet one of my son's for lunch in Anchorage...yes..I'll be stopping at JoAnn's...again!!! I hope I remember that darn coupon for 40% off one item this time! At least the view from my sewing studio is spectacular today. Here's what I bought yesterday at JoAnn's. A fortune in DMC floss if I had been paying Paris prices. And look...disappearing markers come in hot pink now as well as purple...sweet! I guess I'll go work on staining some closet shelves since I can't work on quilting projects. This is what I woke up to on May 18th in Eagle River, Alaska. Over six inches of new snow on the ground on May 18th is not "normal" .... even in Eagle River, Alaska. It's official. We broke a weather record in Alaska. This is the longest winter on record. So why would this be my fault? Europe broke the record for the longest winter in 130 years...this year...my first winter in Europe. Seems to be a pattern. I am embracing the Christmas-like atmosphere. I opened a box of my cross-stitched ornaments. I have a few obsessions...making Sandra Cozzolino santa ornaments is one of them. I pulled these out to review how closely I trimmed the green felt I put on the back of the finished ornaments. Happily, I have 18 ornaments to add backing to and 12 of those are done. Hopefully you can't tell this felt is stitched to the ornament. I used to glue on the backing as recommended by the pattern but I have a real aversion to glue...it has a tendency to stop adhering with the passing of time. I'm old enough to have seen this for myself. Did I mention the roads are horrible? I think all the plowing trucks for the city have already removed the plows so they could work on summer road construction projects. I'm pretty much stuck at the house. So...fumbling around in my studio I found this stocking top I never finished adding the backing. Might be a good day to make a new YouTube video about that process. I also finally got my order of the latest Bucilla stocking and ornament designs. But I'd really rather be inspired by tropical colors. My first quilting-related purchase once back in Alaska was the book by Kim Brackett that was released while I was in Paris. I love all her books...including the newest one. I just pulled all this from my stash. I haven't been able to pick which pattern I'm going to make...I have plenty to work on for now. I feel like a new mom! I have pictures of Batiki Argyle made by other quilters! Quick review...Batiki Argyle is a free pattern on my blog...look at the top right for free patterns. I hope to add more patterns to this section of my blog but living between two continents has slowed down some of my plans. Back to Show and Tell! This is Michelle's version. 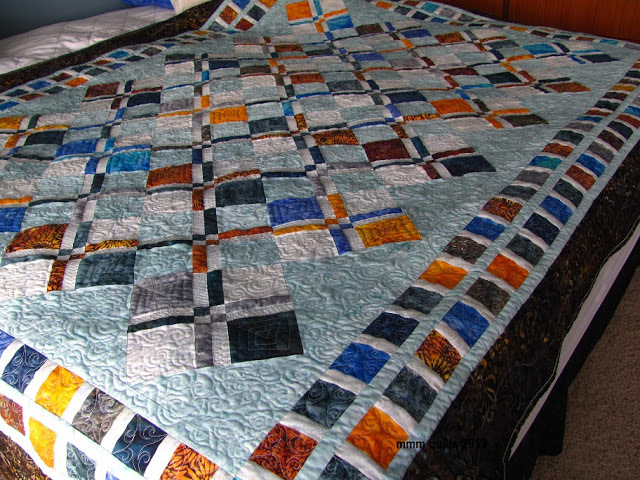 She's a machine quilter and, lucky for us, she's also a blogger. 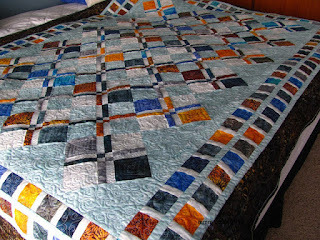 Check out Michelle's posting about her work on Batiki Argyle at mmm quilts . I love Michelle's quilt! It's batiks! I love her border fabric...and now I have some ideas on how to quilt my top. Michelle also added a row to make the quilt bed-sized. I want to make this pattern again and I think I will follow Michelle's idea. Gail's batiks are right in my comfort zone! What I love about her version is the darker background color she used. I have to try that too! My favorite batik manufactures are Hoffman and Kaufman so I check their websites often to see what new batiks they are releasing. 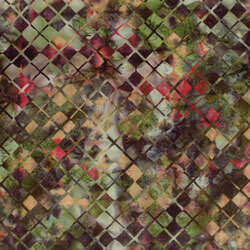 Hoffman has just released a set called "Batik Argyle." Parfait! The "traditional quilter," in me likes to pick a border fabric and pull colors for the quilt from that. But wait...there is a second colorway. Alaska quilt shops can be a month behind "lower-48" quilt shops in getting the latest fabrics so I haven't seen these yet except via the internet. I'm pretty sure these fabrics will be traveling to my Alaska studio. I have some other border ideas floating in my head I might try, too. I had a fun visitor on Saturday. Meet Titus, a five-month-old Berner. He belongs to my son's girlfriend, Madison. We spoiled him...he got to sit on the couch with us. Not much happening in the sewing room. Just too much to take care of with house projects. I did finish another Santa cross stitch ornament. Lets just get the bad news out of the way...it snowed yesterday! I was thrilled to be in my car again even if I had crummy weather...that's what all-wheel drive is for! Here is the view from the backside of our Alaskan home...absolutely no neighbors that direction until you get over those mountains. The west side of the house...no neighbor for about three-quarters of a mile. We have neighbors on the east side of the house...not too close. And the view from the front side. "Silence," is the sound I hear the most. I love my high-speed internet! My American washer and dryer! My spacious American house. Enjoying my modern conveniences. The best was having both our sons over for dinner last night! Today all my menfolk are at the annual airplane trade show in Anchorage. I'm puttering in my spacious sewing room!!!! Here's a recap of the view from our Paris apartment. Missing the great food in Paris...Alaska's produce has always been icky...seems completely horrible now!